Margaret Collier, a young, attractive, recently widowed American girl, stands at her hotel window looking out over London on a sultry night and is inadvertently caught up in the intricacies of a murder that involves distinguished looking, coldly remote Englishman Hugh Vane. Giving way reluctantly to a compulsive urge to discover the facts of the murder, she seeks out Sir Hugh at his ancestral estate, Monks’ Court, deep in the Shropshire countryside, and once the site of an ancient monastery. 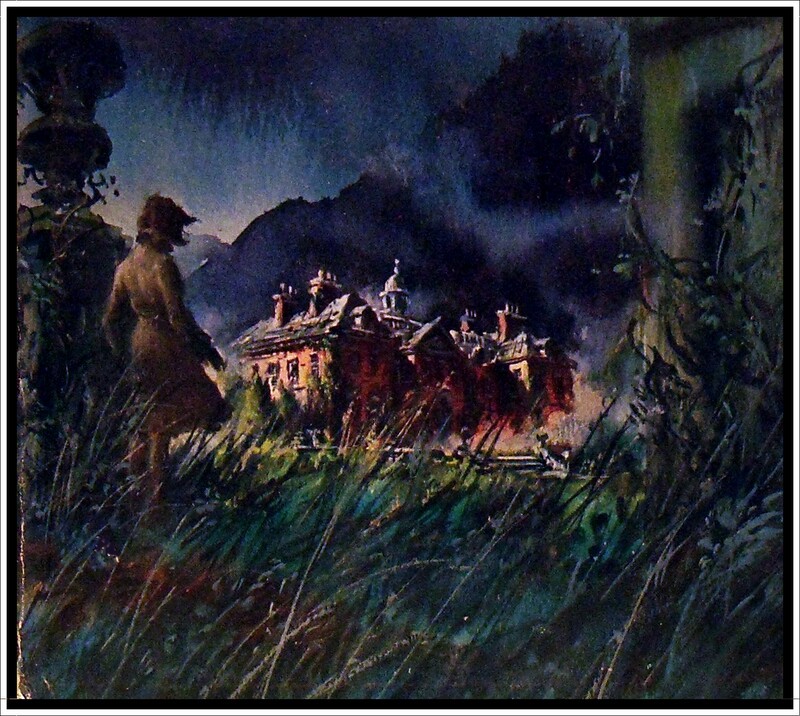 The spell cast by the enigmatic Sir Hugh and by his beautiful and fateful house are Margaret’s undoing. She is enmeshed in events that take a terrifying turn when the threat of a second murder arises. This time, it is her own life that is menaced, and it is seemingly only the ardent devotion and determination of an American newspaperman, Richard Page, that offer her any hope of escape from the net that is tightening around her. Once again, Katherine Wigmore Eyre has proved herself expert in creating the atmosphere for a plot charged with excitement. Glimpses of London and the English springtime countryside provide an authentic background for her story. In this splendid, fast-moving tale she demonstrates her mastery of the novel of suspense. Copyright Katherine Wigmore Eyre 1966. Published by Appleton – Century Meredith Press. Jacket painting by Charles Geer. I bought this lovely first edition hardcover for £1 at the street market yesterday. 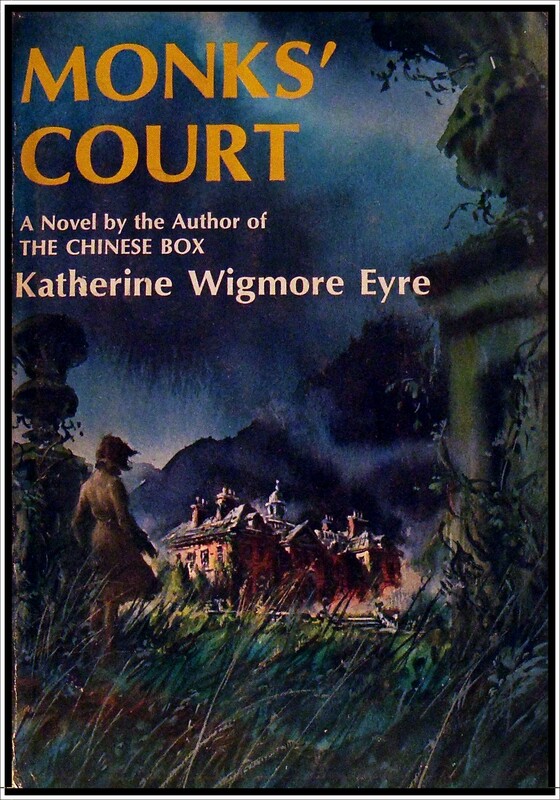 I’ve reviewed another of Katherine Wigmore Eyre’s gothics, The Sandalwood Fan, last year and I struggled to finish that book due to its slow pace and lack of gothic mood. Monks’ Court, with its ancestral, ‘fateful’ house and rural setting, certainly sounds a little more promising so maybe I’ll get round to it one day. Though I’m not such a huge fan of hardcover books, I love it when I find one adorned with a cover sleeve in such good condition. The artist, Charles Geer, has illustrated a number of gothic dust jackets and he has a very distinctive style – especially his gorgeously ruinous and rambling houses. Check out more of his amazing artwork HERE and HERE and HERE. 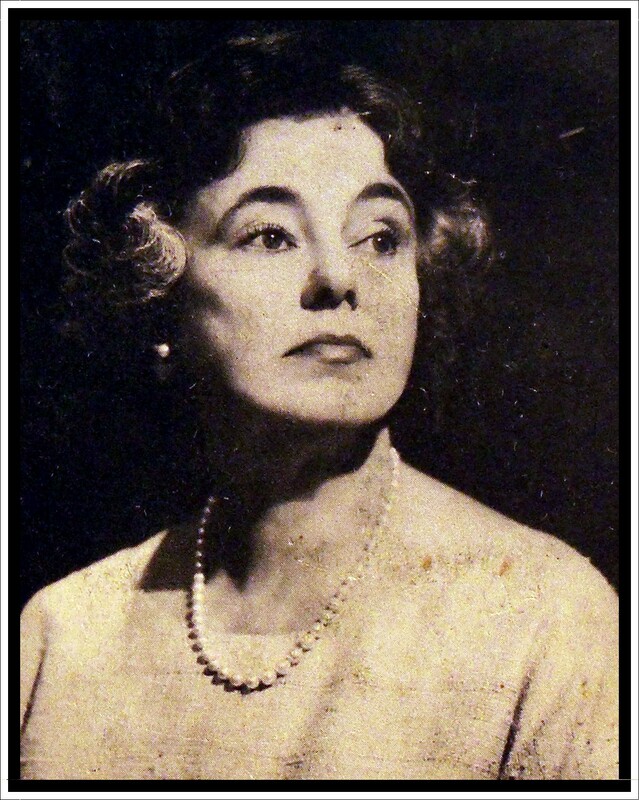 Another bonus is this lovely photograph of the authoress on the back – that dramatic lighting combined with such a classy pose makes her look every inch the quintessential gothic romance writer! WAS THERE NO ESCAPE FOR MAUD RUTHYN FROM HER SINISTER UNCLE SILAS? “When I closed my eyes I saw him before me still, dressed in deathly black, ashy with a pallor on which I looked with fear and pain. Maud Ruthyn was obliged to live with her mad Uncle Silas in his isolated, terrifying old mansion for four years if she wanted to receive her inheritance. If she ran away she would be penniless. If she dared to stay, then one night she would be found lifeless! 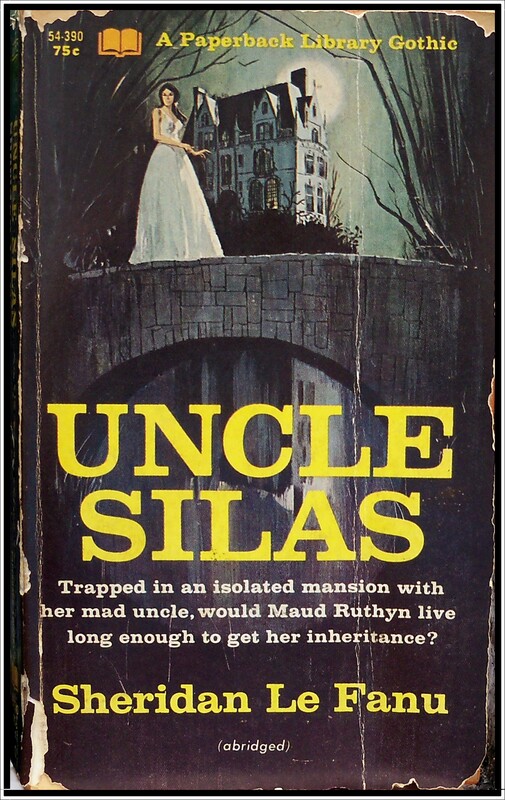 UNCLE SILAS ranks with THE MOONSTONE, THE WOMAN IN WHITE and WUTHERING HEIGHTS as one of the most haunting, terrifying Gothic novels in the English language. Written by Sheridan Le Fanu. This Paperback Library Edition – January 1967. Known as the father of the modern ghost story, Sheridan Le Fanu is a Victorian novelist and short story writer whose prose continues to chill and inspire to this day. 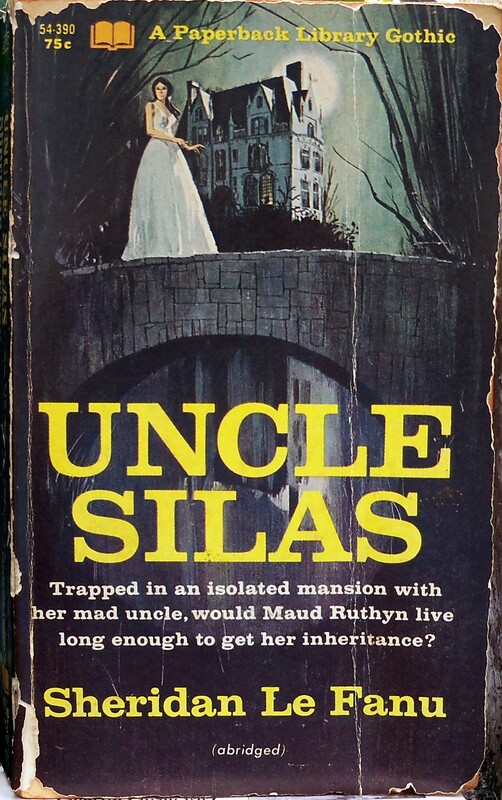 Virginia Coffman, creator of the fantastically gothic Moura series, cites him as a major influence of hers, so I was very pleased to happenchance upon this gorgeous Paperback Library edition of Uncle Silas on a day out in Eastbourne the other week. This is a classic gothic story – where an orphaned teenage heroine, duty bound to the wishes of her dead father, finds herself having to live with her strange Uncle Silas until she is old enough to claim her inheritance. So all she need do is live long enough to come of age and claim her money. How difficult can that be? 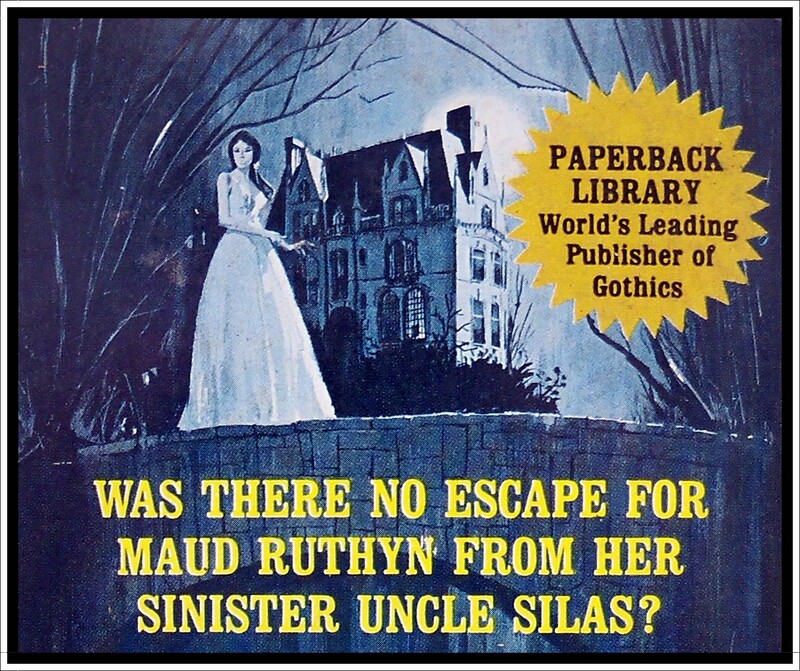 Well, for Maud Ruthyn it’s an isolated, scary existence, trapped in a gloomy old mansion, haunted by sinister secrets and strange visions, with naught but the usual cast of crackpots for company. I’m about two thirds of the way through and though nothing too terrible has happened to Maud, I’ve a feeling there’s something more menacing going on behind those crazed, opium-glazed eyes of her Uncle’s than Swedenborgianism. With three hundred and fifty pages of teensy-tiny typeface (times like this I miss my Lancer Easy-Eyes!) this abridged edition is at least twice the length of most my other Paperback Library gothics and is a treat. Stories like this are written to linger over – I’ve been buried in this book for the last ten days or so and can’t put it down. Five out of five stars with extra gothic points for this copy since it looks (and smells!) as if it’s been providing sustenance for the rats while lying on the floor of a dungeon somewhere. … held a mystery as impregnable as the walls of the castle. Skeletal hands appeared at its window. Low sobbing floated from behind its iron door, and a broken voice ceaselessly sang a child’s nursery tune. Dory heard the sounds and saw the shadows move but the others blamed it on the howling wind and her imagination. Or had she stumbled upon a secret that would keep her forever entombed inside the castle? Written by Jane Corby. A Macfadden-Bartell Gothic 1972. This book treads a similar path plot-wise to Rona Randall’s Leap in the Dark (reviewed last year). Both involve rich, befuddled grannies prone to forgetting who their relatives are and therefore vulnerable to unscrupulous impostors hell-bent on stealing the family fortune. Granny Dugald lives alone in a huge, old castle laden with treasure. Her son, Ronald Dugald, died twenty years ago in a plane crash. She has never accepted his death, clinging to the belief that he is still working as an archaeologist in some far-flung part of the world and has merely forgotten to phone. Then a man claiming to be her son turns up on her doorstep and she is overjoyed. Enter our heroine, Dorcas Lane or Dory as she prefers to be known. Dory is the real Ronald Dugald’s daughter and knows her father is dead. She has never met her grandmother but is horrified to learn what is happening and so makes it her mission to travel to Stone Hall in order unmask this pretender and see that justice is done. Arriving at Stone Hall, it is obvious to Dory something is very wrong. The castle has been remortgaged and many of its treasures auctioned off. All the servants have been sacked and replaced by a very sour-faced cook and her half-witted son, Leon, who likes to stroke people’s hair and collects ‘shiny things’. Then there is the pretend-Ron himself – his clothes are too bright, he laughs funny and, worse of all, he loves modern furniture. Dory is furious someone so ill-bred, so gauche is getting away with pretending to be her father. However, her stay at Stone Hall is proving to be very, very dangerous . . .
Peril was not a bad gothic to start off the year, even though the plot was pretty predictable. Extra marks awarded for the castle Stone Hall, which we learn was built by a pirate in the 17th century in order to stash his booty. Perched on the edge of a cliff and riddled with secret passages, this made a great gothic setting. With its crumbling cliffs, tottering bell towers, collapsing secret chambers and even some booby-trapped abandoned mines, this place would give anyone nightmares. Three out of five stars.